“O God, Shepherd and ruler of all the faithful, Look favorably on your servant Pope Francis, whom you have set at the head of your Church as her shepherd; grant, we pray, that, by word and example, he may be of service to those over whom he presides so that, together with the flock entrusted to his care, he may come to everlasting life." Advance Directives reform is one of the highest priorities for the Texas Bishops this legislative session. The legislation supported by the Bishops—SB 303, introduced in the Texas Senate by Senator Robert Deuell—would reform end-of-life care by improving communication between medical providers and families and balancing the protections of human life and a medical provider's conscience. 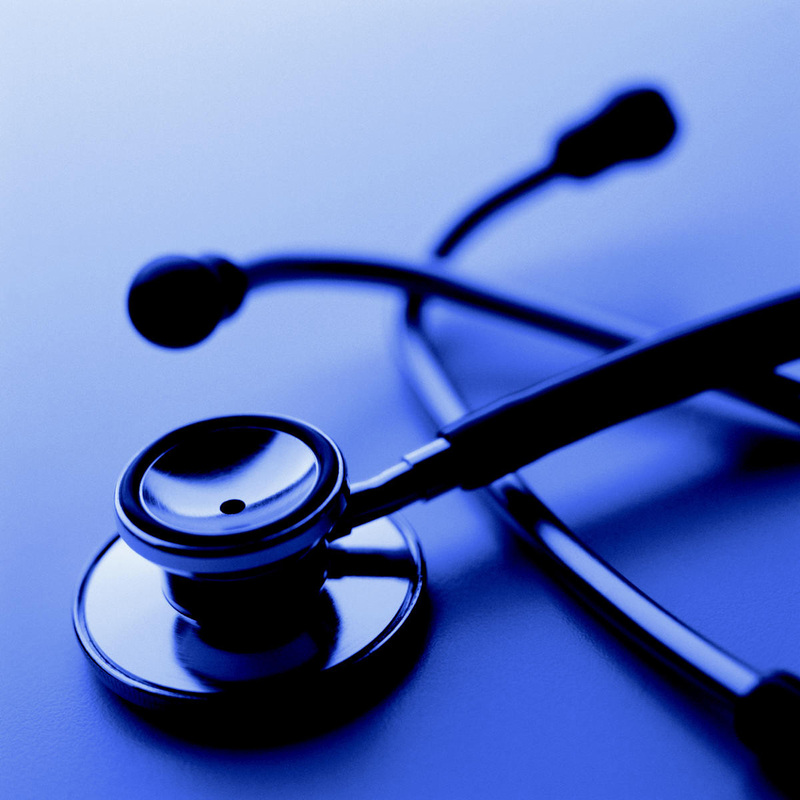 The Bishops and the Texas Catholic Conference support this bill because it is based on Catholic moral principles and on reasonable medical standards for protecting patients, families, and physicians. Continue reading. Click here for list of pending TX legislation affecting life issues. Watch CBS 11 interview of CPLC's Becky Visosky regarding proposed legislation to raise standard of care at TX abortion facilities. Don't miss your chance to speak up for the most vulnerable among us on April 9th at Catholic Advocacy Day in Austin. A final briefing in preparation for Advocacy Day will be held tonight, Wednesday, March 20 at 7 p.m. at Holy Trinity Parish (Gym). Click here for more information and to register. 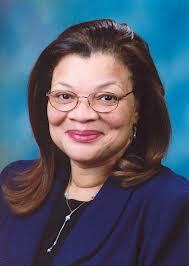 Pro-Life Community to Welcome Dr. Alveda King to Keynote the Bishop's Dinner! On April 6, 2013, author and life advocate Dr. Alveda King will keynote the 20th Annual Catholic Pro-Life Dinner hosted by Dallas Bishop Kevin J. Farrell and benefiting the Catholic Pro-Life Committee, the Respect Life Ministry of the Diocese of Dallas. Dr. Alveda King is no stranger to fighting for those marginalized in our society. [She] grew up in the civil rights movement led by her uncle, Dr. Martin Luther King, Jr. Her family home in Birmingham, Alabama, was bombed, as was her father’s church office in Louisville, Kentucky. Alveda was jailed during the open housing movement. She sees the movement to protect the unborn as a continuation of the civil rights struggle. Join the "Project Life" series – a new adult 8-week pro-life teaching series created by the Catholic Pro-Life Committee in collaboration with Anglicans for Life. The next class on March 21 will address "Euthanasia and Assisted Suicide: Who Controls Death?". A full class schedule is available at prolifedallas.org/projectlife. Sponsored by St. Patrick's Respect Life Ministry. 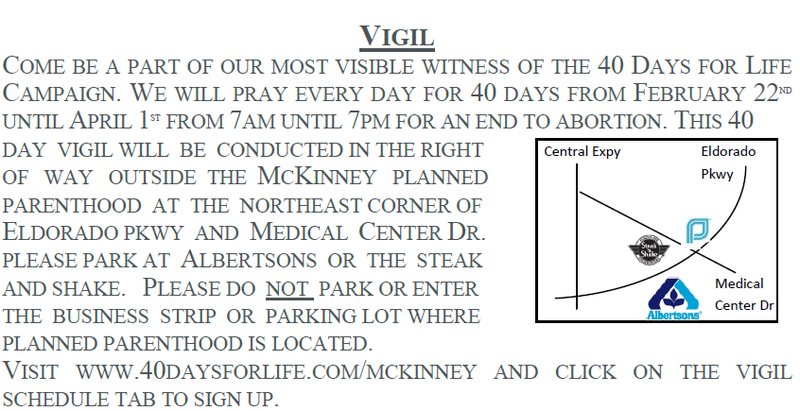 The prayer vigil continues through March 24 from 7 a.m. - 7 p.m. in the right of way outside the Planned Parenthood at the northeast corner of Medical Center Dr. and Eldorado Pkwy in McKinney (map). We encourage you to to come at least one more time during this final week and for the final hour of power to close the Vigil! Please park at the Albertsons for the hour of power. Sponsored by 40 Days for Life-McKinney. Save the date for the Victory Celebration on April 7! An estimated 200,000 faithful flocked to St. Peter’s Square for the Inauguration of the Petrine Ministry Mass celebrated by Pope Francis this morning. . . . Prior to the start of the Mass, Pope Francis greeted the faithful aboard an open-top SUV, foregoing the bulletproof Popemobile. 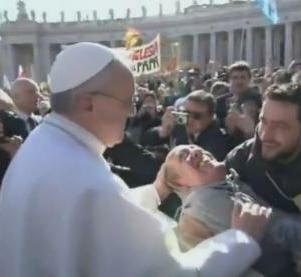 During the drive around the square, the Holy Father asked the motorcade to stop in order to personally greet one of the faithful present who suffered from a physical disability.